Rarely used in the 8 years I have owned it. Slight normal wear on faceplate. The BAE 1073 mic pre/3-band EQ is as authentic as you can get to the original. Class A/B discrete, with the same St Ives (Carnhill) transformers, Elma switches and Canford wire as the vintage modules. The BAE 1073 looks identical to the original vintage module and is made with exactly the same PCB's, hand-wired looms, and circuitry as the originals. Fixed 12 kHz high-shelf +/- 16 dB. High pass filter points at 50 - 80 - 160 - 300 Hz; 18 dB per octave slope. Low EQ shelf: 35 - 60 - 110 - 220 Hz +/- 16 dB. Hi-mid EQ points: 360 - 700 Hz - 1.6 - 3.2 - 4.8 - 7.2 kHz; +/- 18 dB peaking. Separate mic and line inputs. Input attenuation from 0 to 80 dB. Hi-Z direct inputs on the front panel. 48v phantom power on the front panel. Balanced mic input, line input and balanced +4 output from XLR connectors on the rear of the module. Output level control functions as fader when going straight to tape. Modules are mounted horizontally and take up only one rack unit each. Oversize power supply provides four times the current needed for optimum sound quality. Made from an authentic reproduction of a Neve 1073 module. 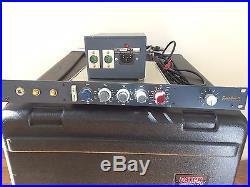 The item "Brent Averill BAE 1073 Mic Pre/EQ withPSU" is in sale since Monday, March 06, 2017. This item is in the category "Musical Instruments & Gear\Pro Audio Equipment\Preamps & Channel Strips". 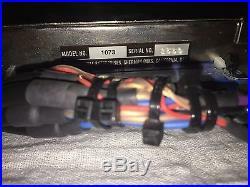 The seller is "fann3620" and is located in Nashville, Tennessee. This item can be shipped to United States.